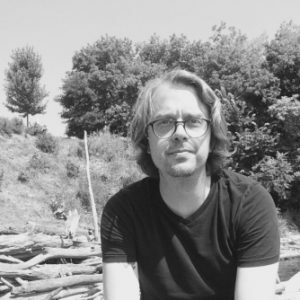 Andy Eaton is the recipient of the Ploughshares Emerging Writers Contest, the Tupelo Quarterly Poetry Prize, and awards from the Bread Loaf Writers’ Conference and the Arts Council of Northern Ireland. His poems appear in or are forthcoming from the American Literary Review, Copper Nickel, Narrative, Ploughshares, Poetry Ireland Review, Prelude, The Tangerine and The Yale Review. He is at work on his first collection of poetry. Who are your biggest poetry influences? Could you talk through how they have influenced your poetry? I was writing for a long time before I knew what poetry was, I mean before I knew that poetry was still a thing in the world, rather than a school subject or something. I didn’t know it was something you could do if you wanted to, like other art forms, and I didn’t know I was doing it. I guess if I ever heard the word, it made me think of castles, all that fairytale and Romantic paraphernalia. I don’t know why. But I was writing things and making songs and didn’t know what I was doing, early on. I say that to say that when I did come upon poetry as an art form and practice in my twenties, I was so excited, and I kind of circled around a few familiar names before I took off into the rest of it. These were, first, James Wright and Robert Hass. These two poets are still very important for me, though I’m not always coming back to them on a daily basis. I could add several familiar names here: Jorie Graham, Elizabeth Bishop, Wallace Stevens, Anne Carson, Lucille Clifton, and more recently Charles Wright and W.S Merwin. There’s definitely a sense of the religious to what I’m drawn to, if by that word I can mean a practice, a sense of rhythm between life and art. I think my upbringing was so chaotic, that I tend to be drawn to that Stevensian echo, the idea of order within the art, at least the art of language and gathering of language. But especially I think what I’ve learned from these poets is how the poem might be (sometimes) a form of thought, or a movement through an idea that a specific mind is making, a movement of language we can follow beyond these first big influences, I could mention Lorca, the Tang poets, and some more contemporary voices from Ireland and Great Britain, but what I’d probably find in them at the end of the day has more to do with me and what I’d be looking for, however limited that might sound. I like the poem to think through something, which it always does, if you learn how to look, which I am trying to always do. How important is being American, writing in Northern Ireland, and working in the England. Has living and writing in different cultures and places affected your poetry? That’s a great question, one I’m trying to answer everyday. I was just speaking last night with some friends about what signs signify cultural difference and which ones don’t. Living in Northern Ireland has been the most stable and invigorating group of years so far, but it has a lot of its own difficulties, almost all around language (of course). It’s a high context culture, but there are many acute ways where I’ve gotten to learn how I think and how this is different to my wife, for example, or the person in the cafe next to me. This all sounds a bit categorical, but I’m just talking about cultural values and patterns, rather than qualitative judgements. Where I come from, or who I come from, in the States, people tend not to talk unless they have something to say or do, and that’s usually not very figurative, though sometimes it can be. Here in Northern Ireland, it’s still very much an oral culture; there’s a lot of talking, and much of it is rhythmic and intuitive. I love that, but it’s foreign for me. In England, where I work, there’s a whole other thing happening, and I’m always surprised at the lack of knowledge about Northern Ireland running through the language and seeming to be apparent in the culture. Although I live in NI, my colleagues often refer to me as living in Ireland, or my UlsterBank ATM notes as ‘Irish’ without batting an eye. You don’t speak that casually about it if you’re here, or at least I try not to. Anyway, what this has to do with poetry is language. And the privilege of getting to feel like a foreigner in my own language has, I think, influenced the way I think through a poem’s composition, as much as how I live, for the better. At least I hope so. What was your thought process and approach to putting together your pamphlet, Sprung Nocturne, how did you pick which poems to include and the order they were presented in the pamphlet? My thought process around Sprung Nocturne was mostly fear. Since I was approached by a publisher who liked and knew my work, I was able to approach it as a conversation. I showed them a lot of poems. In the end, they chose some and I chose some, and they were I think happy. I think, like with writing, I chose poems mostly (as Flannery O’Connor says) by smell. The order came about in a similar way. I guess I wanted to move from the figurative to the literal, if that was possible, or to somehow suggest a fuzzy image giving way to something hard and clear. But what matters is probably page count, long and short poems, that kind of thing. I liked ending on a really long poem. One of my favourite poems in the collection is ‘Recollections form the Book of Wind and Brass’, could you comment on this poem, and how it came about? Is this based on a real book, and the relationship between the imagined/real book and the poem? Thanks! This poem came about through listening. I like to say this for most poems, which is true to some extent. But with ‘Recollections’ I could feel the rhythms of language as pulse before I saw the images, though these came quickly afterward. I have a vague memory of a friend telling a story of someone being buried with seeds or nuts for memorial purposes, but they seem not to remember this, and neither do I very well. Anyway, that idea or image or figure was floating around in my mind, and this idea of a book appeared. I like to write in the mornings, as early as possible, when I can. This was one of those. Well, it’s not based on a real book, no. But it’s based on a book I have seen in my imagination, which has a reality, for me at least. I’ve always been drawn to myth and anecdote, but what pulled me away form these to poetry was that poetry didn’t imply an ideology or interpretation. A somewhat sacred text that is lost or blank or without interpretation is sort of a holy grail in my mind, to mix symbols. Anyway, there’s not an ideological or philosophical position between an imagined or real text, but I wanted to suggest a book we may have missed out on. I guess I could answer this better in a longer essay or something. I know I’m wanting to create a figure for absence and loss, and some of that is around elegy and some of that is around imagination and belief. In any case, it came about as an apparition and has stayed with me, and is beginning to come back. The imagined book helps me write. I think that’s the relationship. In the poem ‘On Movement’ you specifically place the poem in a real place and time in the past, how important is history or the re-telling of history important to your work? This poem is set in a specific place in order to write it, but I hope it both is documentary or witness but extends beyond them as well. There’a a real human voice, a vox humana, behind the poem and a real story too. But it’s a family story, and I wanted to venture from that musical note of personal narrative or recollection to something almost universal but linguistic. Congratulations on winning the Ploughshares Emerging Writers Contest in the poetry section, the judge Natalie Diaz said about your poems that: ‘These poems have a lexicon and language all their own…….The energy in the poems is quiet yet palpable, as if writing them down was a risk, a danger—as poems should be, maybe—a danger to see, to feel, to return to in memory or imagination’ – is this sense of danger and preciseness of language something that you have thought about in your own work? Thanks, again! To say I’ve thought about it in my work is to say I’ve thought about it in my life. Almost exclusively. Language terrifies me. It really does. But it also fills me with joy. Trepidation is the word, I suppose. I’m drawn to language, and so I seek precision. But I also see it is outside of me, so in a sense a danger, or rather, something neutral that carries with it all that I bring, so therefore it exposes me to myself. I don’t ever sit down to write a poem and have some linguistic feature that I want to effect. Maybe this occurs to me over time, but it’s usually form what the poem’s already doing, and I’m just trying to listen close enough to score it. However, that danger and preciseness must be something I carry into the poem; it’s something I carry into conversations. That precision can also be dangerous. I’d love my poems to sound more like good talk, but talk is so difficult for me often, and thinking is so ranging, that I think the poems sometimes suffer from this. A poem like ‘Draining the Lake’ is partly an attempt to stay true to a mind at work while moving toward a clearer and simpler language. In several of your poems you are playful with form, and how poems are placed on the page, how important is strict form, like a sonnet, to you in your writing? Thank you for asking about form. Form and structure are central to the poem for me, but not always to every stage of composition. I would hesitate to use the word ‘strict’, but rather ‘received’; (not to be difficult!). I would probably feel comfortable talking about a poem revealing its form to the poet, and that sometimes you’re writing a sonnet, etc. But this is probably because you’re thinking like a sonnet before and during you’re relationship with that language and subject. I don’t think of myself as an experimental poet or a poet who is focussed much on layout, but I do appreciate typography, and I love the page itself. How important is your academic research for your poetics, does it still influence your writing directly? Back when I first learned that poetry was, I thought the best place in the world to be was in a university classroom, or a library, or talking about books. I thought this since I was a child, watching my parents earn their undergraduate degrees. I have an unrequited love relationship with academia. But academia is different from the university itself, for me, and a university library is where the books are. Charles Wright said that once and I laughed all day. But it’s true. So academic research helps inform a poetic practice in as much as that research is meaningful reading. It also helps as any part of life helps, to show you some of what counts, and some of what doesn’t. At the minute, I’m reading Flannery O’Connor’s The Habit of Being (letters); Elaine Scarry’s The Body in Pain; and Lincoln in the Bardo by George Saunders. Well, I have a manuscript. And some notes. Apart from that, teaching and travel. 10 Years On | Is Funny Games A Soulless Exercise In Movie Violence?